This is Melissa from Moe Creations! It's time for another Action Wobble post. I got this cute little owl from a coloring page and turned it into an SVG file. 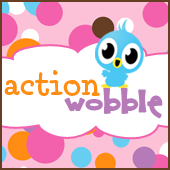 Here is the Action Wobble! I thought he was just adorable with those huge eyes, what do you think??? Well I hope you have enjoyed my post for today!!! I think he's adorable too. Great card!